Zauberwald (Enchanted forest) - 4 ply gradient yarn, 4 colors: peach, jade, opal, petroleum. Fiber Content: 50% cotton 50% polyacrylic. Brennende Sehnsucht (Burning longing) - 4 ply gradient yarn, 8 colors: cream, dragon-fly, aqua, capri, pigeon blue, Prussian blue, violet, amethyst. Fiber Content: 50% cotton 50% polyacrylic. Abendglut (Evening embers) - 4 ply gradient yarn, 7 colors: pea, concrete, mud, khaki, olive green, brown, chocolate. Fiber Content: 50% cotton 50% polyacrylic. Power of Universe - 4 ply gradient yarn, 12 colors: gray mottled, anthracite mottled, black, petroleum, jungle, gentian, bishop, tourmaline, purple, black, anthracite mottled, gray mottled. Fiber Content: 50% cotton 50% polyacrylic. 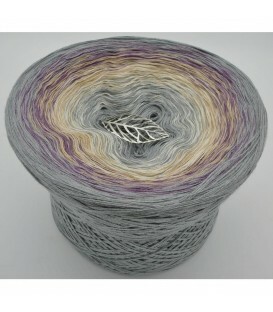 Silver Touch - 4 ply gradient yarn, 5 colors: silver mottled, cream, beige, violet, silver mottled. Fiber Content: 50% cotton 50% polyacrylic. Sehnsuchtsvolle Gedanken (Yearning thoughts) - 4 ply gradient yarn, 3 colors: vanilla, lilac, violet. Fiber Content: 50% cotton 50% polyacrylic. Frühlingstraum (Spring dream) - 4 ply gradient yarn, 11 colors: Kiwi, leaf green, frog green, fern green, fir green, chianti, blackberry, raspberry, oleander, Milka, amethyst. Fiber Content: 50% cotton 50% polyacrylic. Lagune im Nebel (Lagoon in the fog) - 4 ply gradient yarn, 6 colors: light gray, mottled lead, gray mottled, anthracite mottled, black, lagoon. Fiber Content: 50% cotton 50% polyacrylic. 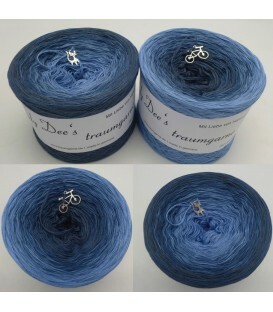 All I need is Jeans - 4 ply gradient yarn, 4 colors: cloud, pigeon blue, Prussian blue, granite. Fiber Content: 50% cotton 50% polyacrylic. Baby Blue - 4 ply gradient yarn, 6 colors: baby pink, lavender, crocus, capri, mermaid, nymph. Fiber Content: 50% cotton 50% polyacrylic. Abendglut (Evening embers) - 4 ply gradient yarn, 4 colors: pink, brick, orange, quartz. Fiber Content: 50% cotton 50% polyacrylic. 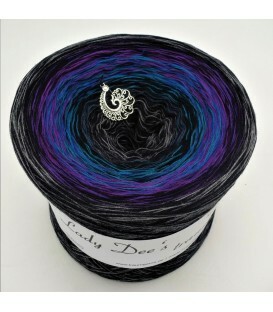 Dark Purple - 4 ply gradient yarn, 5 colors: Milka, oleander, black, thistle, bishop. Fiber Content: 50% cotton 50% polyacrylic. Abendromanze (Evening romance) - 4 ply gradient yarn, 4 colors: mauve, light gray, mottled lead, gray mottled. Fiber Content: 50% cotton 50% polyacrylic. Flüstern des Wassers (Whisper of the water) - 4 ply gradient yarn, 4 colors: mermaid, light gray, mottled lead, gray mottled. Fiber Content: 50% cotton 50% polyacrylic. Mondschatten (Moon shadow) - 4 ply gradient yarn, 6 colors: light gray, lavender, crocus, Milka, purple, black. Fiber Content: 50% cotton 50% polyacrylic. Sternennacht (Starry night) - 4 ply gradient yarn, 5 colors: vanilla, rose, cloud, Malibu, purple. Fiber Content: 50% cotton 50% polyacrylic. Buy gradient yarns from Lady Dee's Dream Yarns in various lengths online. Crochet and knit with gradient yarn in a very large variety of colors. 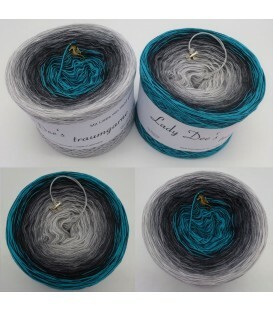 For each of these wonderful gradient yarns you can order the matching monochrome eggcup to lengthen, as long as the egg ball is also in stock. 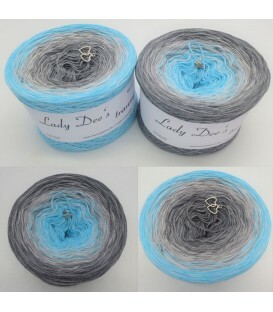 These egg balls (monochrome lace yarns) are suitable for lengthening super for the beginning of the crochet piece or piece of knitting at the beginning or as an end. With every "Bobbel" from our diverse assortment, you can produce magical projects. 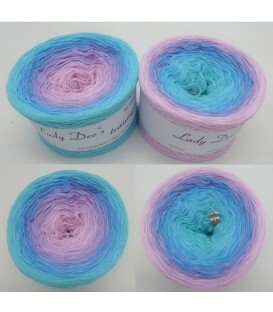 Crochet yarn and knitting yarn with beautiful color gradient, in many different color combinations for you. 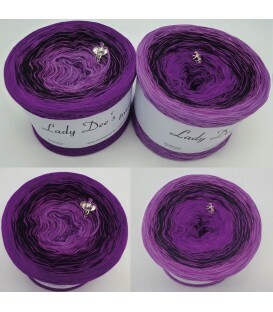 These gorgeous gradient yarns from Lady Dee's Dream Yarns are perfect for fine laces, scarves, stoles, but also for sweaters, jackets or ponchos. 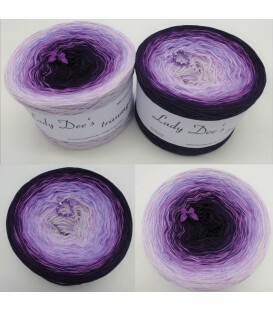 The gradient yarn is affectionately referred to in Germany as Bobbel and in English as cakes. 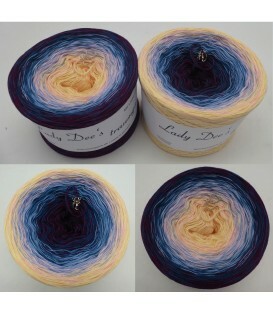 These great gradient yarns either change the color slowly in color or change directly into a completely different color tone. 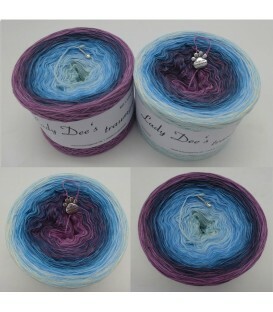 Due to the small mini knots when changing color, the Bobbel have a nice soft color transition. With these colorful combinations from our range, you can not go wrong! 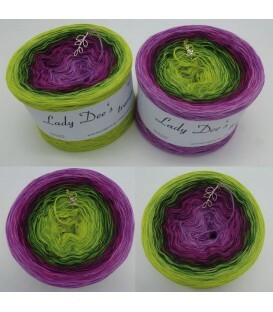 All color grading yarns are unique, since they are handmade. 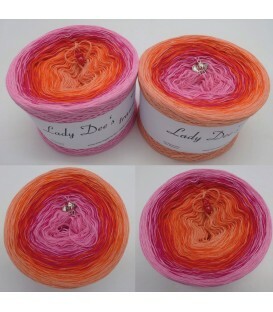 Lady Dee yarn - cotton mix color course yarns. 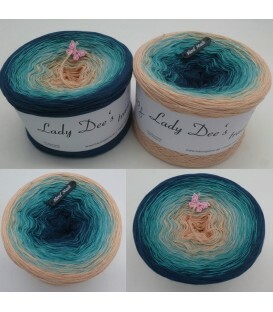 It does not matter if you want to knit sweaters, socks, caps or scarves, with the colorful gradient yarns in our range, you can crochet or knit beautiful unique items. The Bobbels are made of cones made of a mixture of 50% cotton and 50% polyacrylic. The material is certified according to "Öko Tex-Standard 100, harmful substances tested" (product class I for babies). The gradient yarn is lined, which means that the yarns lie next to each other and are thus not twisted. With the Bobbel's in different color variation variations, unique projects are created for your projects.